New Jerseyans have a crazy love affair with crumb cake. It is sold in every bakery, diner, and bagel shop across the state. From north to south and east to west, New Jersey is overflowing with crumb cake and Jerseyites never seem to tire of eating it. There are even heated discussions over steaming cups of coffee and huge pieces of crumb cake in the local diners as to which part is the most cherished and desirable - the cake or the crumb. It can be a messy proposition to eat a piece of crumb cake. All that crumb is crumby. I am surely not complaining, but sometimes I like to take my treat on the road. I decided it was time to develop a handheld version of this popular bakery treat. It would need to be easily portable for a quick breakfast while heading out the door and sturdy enough to be packed in a lunch bag and still make it to school with crumb intact. After some trial and error and lots of taste testing, the perfect Crumb Cake Muffins were born. And my No Thank You Boy deemed them "the best muffin.....ever." With a dense, moist cake-like muffin base and a heaping layer of crumb that both sinks slightly and graces the top of the muffin, the portable baked good does not disappoint. Make a batch of Crumb Cake Muffins this weekend and decide for yourself which part of the muffin you like the best - the crumb or the cake. It is a tough decision, but it will be tasty trying to decide. Preheat oven to 350 degrees. Line a regular sized muffin pan with muffin papers and set aside. In a large bowl, combine the crumb topping ingredients and stir to combine into large chunks. Set aside. In a small bowl, add vinegar to half and half and set aside. In a large mixing bowl of a standing mixer, combine the flour, sugar, salt and baking soda. With mixer on low, add the butter chunks, one at a time. Mix for about 2 - 3 minutes until mixture resembles a coarse crumble. Add eggs, vanilla, and half and half mixture. Beat on medium high speed for about 1 - 2 minutes until smooth. 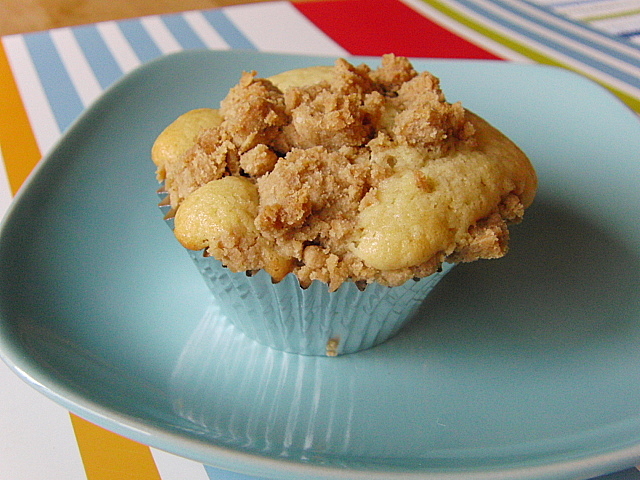 Fill muffin papers about 2/3 full and top with a generous amount of the crumb topping. Bake for 18 - 20 minutes or until toothpick comes out clean. Let cool in pan for 5 minutes and then remove to a cooling rack. Store at room temperature for 3 - 4 days (if they will last that long ;) . * - If you do not have cake flour, you can make your own with all purpose flour and cornstarch. Here's the formula: Take one level cup of all-purpose flour, remove two tablespoons, and then add two tablespoons of cornstarch back in. In other words, 1 cup all purpose flour - 2 tablespoons all purpose flour + 2 tablespoons cornstarch = 1 cup cake flour. I have a boy who would claim the whole batch as his own! They look fantastic! Can't wait to try these, they look so good. Thanks for the recipe. This looks yummy! I love that there is a cinnamon. Can't wait to try. Thank you for sharing this treasure. anonymous and Bugarska Leto- you are welcome!! teresa - you will love NJ!! and it is not all Jersey Shore and the like ;) welcome!! Those look so delicious!! Love crumb toppings. biz - thanks! I actual made a double batch and put half in the freezer for future baking endeavours.